Proximity marketing or location-based marketing has taken several forms over the years – flyers, sign spinning, and OOH advertising. But, proximity marketing with beacons has become and will continue to be the most popular, cost-efficient way to send out proximity marketing campaigns. By 2020, 400 million beacons are expected to be deployed. Simply put, a BLE beacon is a Bluetooth transmitter capable of sending data to smartphones. You can read all about it here. Proximity marketing not only helps SMBs establish a relationship with customers, improve their in-store experience but it also helps when there is a ton of local competition. Contrary to popular belief, consumers are not technophobes. 67% of consumers believe that retailers should make in-store technology a priority. With the numerous data breaches coming to light, consumers have become hyper-aware of what data they may be potentially sharing. Beacons do not collect any personally identifiable information putting any privacy concerns that may arise to rest. So, how can SMBs start running proximity marketing campaigns with beacons? One way to do it, also the hard way, is by purchasing the hardware from a beacon hardware company and then spend time configuring it, setting it up and looking for a compatible third-party software to run campaigns. If SMBs choose to hire a developer instead, depending on the complexity of the platform, it can take anywhere from 6 months to a year. This is also not a viable option for most SMBs given the time and financial commitments. That is why a more comprehensive solution is recommended. Beaconstac consists of a 5 part solution designed to make proximity marketing through beacons a seamless and effortless process. Choosing the right beacon for SMBs when buying from a hardware company may be a hit or a miss. Purchase from Beaconstac and you get thoroughly field-tested beacons that work exactly as intended. Beaconstac beacons are compliant with both the Eddystone and iBeacon protocol – the two protocols through which beacons communicate – allowing SMBs to use the same beacon for more than one use-case. Why settle for one beacon when you can choose from 6 different ones? Beaconstac offers a fleet of beacons each intended to give certain use-cases a powerful boost. Need help choosing which beacon is right for you? Read our guide to buy beacons! Easy deployment – No configuration needed. You can either stick or screw the beacons to walls, ceilings and/or entry-exit points within minutes. Not to mention that all beacons come pre-configured and work straight out of the box. Beacons are safe from any type of security threats and parameters cannot be modified without authorization. The beacons intended for outdoor use are waterproof, temperature-resistant and dustproof lending SMBs more flexibility when deploying them. The Beaconstac app for Android and iOS allows SMBs to manage their beacons efficiently. The app informs you of how much battery is left in the beacon. This lets you know if you need to replace the batteries soon. Easily turn on or switch beacons off from the app to save battery when not in use. The transmission range determines how far a beacon can send notifications and the advertising interval defines how frequently the message is to be sent. Easily set or modify these parameters from the app. As an SMB, you can choose from different types of campaigns – interactive forms or markdown cards (aesthetically pleasing campaigns) or even redirect users to a website or a landing page of your choosing. Since the platform is cloud-based, you can easily modify or run campaigns remotely either on a desktop or mobile. Setting up and running your first campaign takes less than 15 minutes. The intuitive platform is easy to navigate and comes with a whole host of features such as schedule campaigns for later, assigning multiple campaigns to one beacon, and setting up rules to target audiences. The dashboard even features QR codes associated with every markdown card that can be printed and used to engage customers walking by. Editing campaigns require no knowledge of CSS. Add media, CTA buttons and even embed Google maps onto a markdown card. You can also change the heading styles, colors, and text. Create a campaign by clicking on one of the beautiful templates readily available to avoid starting from scratch. See which beacons are performing well, the number of notifications sent, and the CTR (click-through-rate). Export this vital data and get an hourly customized report to fine-tune your campaigns. The dashboard also allows you to integrate your Google Analytics account with Beaconstac to gain a deeper insight into your audience. Should you wish to integrate the SDK into a widely used app like a local shopping app, the NearBee SDK is available to convert any app into a beacon-aware app. As an SMB, you can also consider building your own app. What can SMBs do with Beaconstac? Deploy beacons strategically to offer proximity based content to in-store customers and ones nearby. Rich notifications can be sent out in real time through the platform. This can be new deals, offers or even product recommendations. Burger King recently trolled McDonald’s and ran a great location-based campaign that let customers who came within 600 feet of a McDonald’s order a Burger King Whopper for 1 cent. Send tailored notifications to customers who frequent your business by allowing to rack up and redeem loyalty points. 86% of shoppers join loyalty programs to collect reward points. Loyalty programs also help advance a business’s relationship with customers. Customer reviews are decidedly important to the point that 95% of shoppers will read an online review before deciding to make a purchase. Displaying these reviews can also increase conversion rates by 270%. Prompting customers to leave a review and follow your business online is an excellent strategy to bring in more business. Customers need additional information before making a purchase. 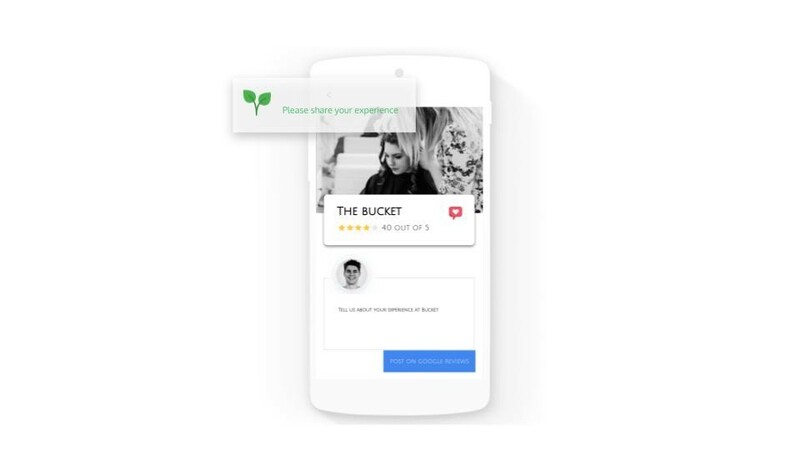 Instead of having a salesperson tagging every shopper, beacons can send them notifications that let them know, for instance, what garments a mannequin is wearing, nutritional information on groceries or even a comparison between two similar products. Take a note from the Amazon 4 store that lets online reviews decide the inventory of the physical brick and mortar store. Send customers interactive forms to get their feedback on inventory or how their in-store experience has been. SMBs can then incorporate this feedback to make the customer feel heard. A bad customer experience is the #1 reason why shoppers switch to other businesses. The Beaconstac dashboard has an Apple Wallet integration that lets every markdown card be saved on the Wallet app on iOS. This is particularly useful when shoppers want to use a coupon for later. Simply insert the Facebook Pixel ID and the Google conversion ID to retarget customers online. An ad response can see a 400% because of retargeting. Restaurants, bars, and cafes can run some tailored campaigns apart from the generic ones above. Send a notification to customers nearby and ask them to order ahead to skip waiting for the food. Paste the QR code on doorways, menus, coasters and packaging to prompt patrons to scan QR codes. You can alternatively use the QR code to promote NearBee downloads as well. Supermarkets and retailers can include the above campaigns in their beacon marketing strategy as well as the ones below. One of the major reasons for cart abandonment is long lines at the checkout counter. Even establishments that offer one of those self-checkout machines often see a worker helping out customers use it. Cashierless checkout is one of the prime reasons why Amazon Go and Zippin have become so popular. But you don’t need such a complex system to implement this. Beacons offer a smooth way to pay for products by sending a payment gateway link to a customer. This hassle-free unmanned operation results in fast checkouts and loyal customers. Retail stores can also allow customers to add products to their online cart by nudging them through beacons and offering free home delivery. Decathlon does the exact same thing by allowing shoppers to scan products and delivers it to their homes. Supermarkets and retailers can offer personalized recommendations and auxiliary products when a customer approaches a certain aisle. For instance, if a customer is shopping for skin care products, they can be gently nudged to check out sheet masks as well. The Schedule feature on the dashboard allows businesses to schedule a campaign for later. This is of great use when there are several promotions to be run back-to-back or during the busy holiday season. Car dealerships can leverage Beaconstac in more than one way. By attaching a beacon to a specific car and adjusting the transmission range, a buyer can immediately look up the features of the car without having to interact with a salesperson. Beacons can also be used to push PWAs to customers who can then use them to book an appointment or a service when needed. With the NearBee app installed, potential buyers can also check out the cars they are interested in, book test drives and leave their contact details even when the dealership is closed. 67% of SMBs built their own apps in 2017 and this number is expected to steadily rise. Even without your own app, an SMB can leverage the entire Beaconstac solution to surge forward using proximity marketing. One of the major reasons why proximity marketing is well received is that it is highly relevant to the end user. 8 out of 10 customers appreciate contextually relevant campaigns. With reducing costs, and increasing awareness of proximity marketing it is only inevitable that SMBs drive this technology in 2019 to deliver an improved in-store experience.